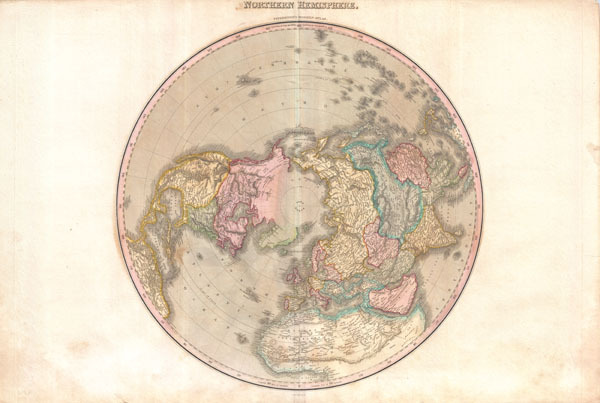 A rare and important 1818 map of the Northern Hemisphere by John Pinkerton. On a Polar projection, this map depicts North America, Asia, the East Indies, and North Africa. In North America, thanks primarily to the work of Cook in the Pacific Northwest, the coasts are rendered with considerable accuracy. The interior of North America, particularly the American West, is still rather vague, though much of the cartography is clearly derived from the exploration of Humboldt and the Louis and Clark expedition. Notes the apocryphal River Buenaventura as well as a conjectural placement of the western extreme of the Missouri River. The United States, still quite small, does not yet include Florida, Louisiana, California or Texas. Asia is drawn with considerable accuracy thanks to Russian and Chinese cartographers, however, there remain some unexplored areas in Central Asia. Africa is well mapped along the coast, but much of the interior is speculative. Shows the mythical Mountains of Kong (supposed southern boundary of the Niger River) meeting the equally mythical Mountains of the Moon (Supposed Source of the White Nile). Pinkerton positions the Mountains of the Moon much farther north than most cartographers and abandons the old Ptolemaic double lake theory. This is a curious decision that we can only assume is based upon speculation that the Mountains of the Moon are part of the same chain as the Mountains of Kong. Far to the north, in the high Arctic, there is a partial land mass with the note 'Coast discovered by the Hunters employed by m. Liakhov.' This land refers to the Lyakhov Islands, discovered in the 1770s by Russian Fur trader Ivan Lyakhov. These islands, part of New Siberia, were said to have such an abundance of fossilized mammoth ivory that many of the smaller islands were formed from it in their entirety. Lyakhov himself brought back 10,000 tons of Ivory on his first trip and subsequent traders are said to have brought back as much as 100,000 tons in the following 20 years. On the opposite side of the Arctic, in North America, there are notations regarding several 18th century expeditions up a number of Canadian river systems. Most of these take the form of 'Icy sea spotted by so and so.' At the time, this was the limit of Arctic exploration in Northern Canada. Drawn by L. Herbert and engraved by Samuel Neele under the direction of John Pinkerton. The map comes from the scarce American edition of Pinkerton's Modern Atlas, published by Thomas Dobson & Co. of Philadelphia in 1818. Rumsey 0732.003. Phillips (Atlases) 724. National Maritime Museum, 409.